I was born in Moscow, in a family with multi-national roots. Being a Russian citizen, I got Greeks, Ukrainians and Persians among my grandparents. The intersection of cultures determined my creative ideas. I inherited my passion for drawing and modeling garments from granny who in the environment of total deficit of that time managed to turn rags into eye-catching stylish clothing pieces. I was around three years old when caught drawing a portrait in mom’s passport. My favorite pastime was sketching of women in garments and most precious toy was a trunk with pieces of beautiful fabrics, yarn balls and books teaching how to sew, knit and embroider. Though I preferred knitting most of all, and years later that hobby resulted in creation of my own knitwear label. My father was a pilot, and in my childhood, I had a chance to travel and live a little in Europe, and see elegant outfits of European women. Many of my current ideas are inspired by my mother’s wardrobe from these days. That also influenced the formation of my artistic taste. Can you take us through your career? It was a long journey to become a designer. At first, my passion was frowned upon by my family. They thought it was a much better idea to study economy to make sustainable career and living in future. I got MS degree in Economy and Marketing in Moscow University of International Relations. That was not something that I really enjoyed, but years later I realized that having worked in marketing for several years in big corporations, I learned how to run a business. Also, I got inspired by stylish purposeful ladies around me, and honed my understanding of a working woman’s wardrobe preferences. Willing to embody my ideas into contemporary modern garments design, I eventually decided to redirect my career into my childhood dream. After a year of intensive self-education and hard work I eventually created my own label in 2012. I did not have enough money to participate in fashion weeks, so I decided to raise funds applying for fashion competitions. I won several awards, including sustainable fashion ones. That allowed me to showcase at fashion weeks in Berlin, Copenhagen, London and Milan. Being a total newcomer in fashion without special education, at first I struggled developing samples, I mean being on the same page with manufacturers. But finally we learned to understand each other, and I am proud of how I managed to settle the process, and grow together with my several small factories. This is one of my biggest achievements, because the technologies like that I apply are quite challenging - mixing different types of fabrics, developing new ways of cutting and sculptural knitting. My garments started selling from the very first collection. After 3 years of working being based in Russia, I decided to move in the place that would provide me development opportunities, and where you can really make it as a designer, on that game changing level. I launched my company in New York and instantly found a partner who was at that moment an Art director in Met Museum. Together we drive our concept of interrupting everyday wear with artistry and craftsmanship. I think everything that has happened to me since I started, overcame all my possible dreams that I had only a few years ago. 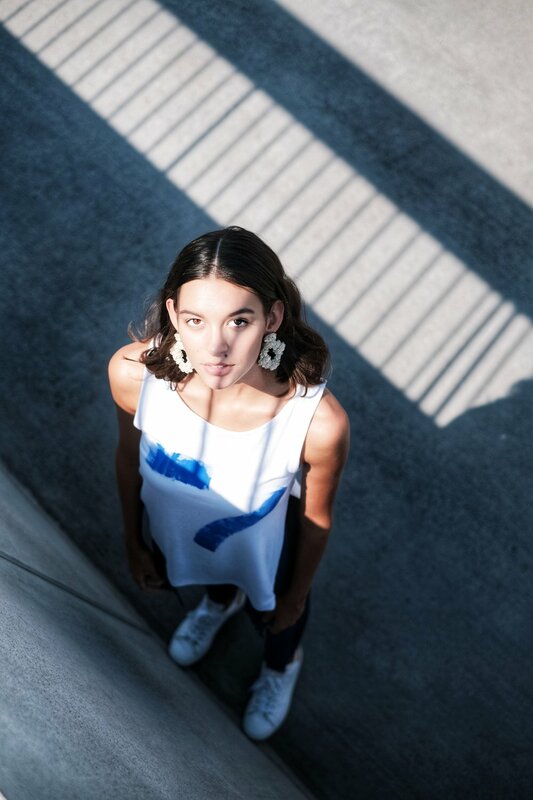 I managed to design clothing that make people feel empowered, creative and comfortable, inventing new technologies and following the values of sustainability. Now I dream to achieve the level where I would be able to really change and improve fashion system, developing local US manufacturers, supporting other creative startups, and aspiring artists and craftsmen. I am currently based in New York and it provides so many opportunities for making dreams come true! Starting working on new collection or project, magic of embodiment of something that never existed, the joy of people who see and wear it, also feeling that you have reliable partners and you made it it work, then creating again...there is something charming in each stage of that challenging cycle. Why did you move to New York? Years ago, being a passionate knitter, I first came in New York to Vogue Knitting Live - a big event where knitters gather from all over the world. I instantly fell in love with the city, and was impressed by Americans’ attitude to crafts, and entrepreneurship. Here, I also first learned what sustainable fashion is. US is the first in everything. I had no doubt I would come again, and after a few more visits, I eventually moved to raise my line here. 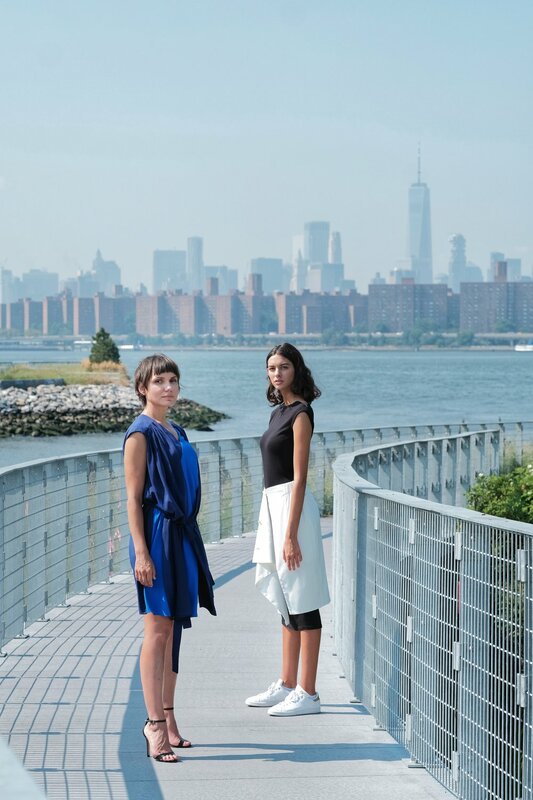 What does it mean for a designer to produce your collections locally, in New York? On the one hand, it allows you to save time, and control the process, and feel good about the fact that you make it here where you belong. But it is still quite expensive for emerging designers, I hope advanced technologies like knitting will once become more affordable. With my elevated design methods, I consider it to be the best way to achieve the sought after quality. What can the designers from all over the world give to american fashion? Authenticity, innovative ideas, original crafts. Traditionally, America is the country where talents from all over the world start to blossom. You had an experience to support the small productions and people who use some unique techniques in Latin America? Yes, going to Peru was a unique experience to me. I work with several producers whom I met their, and their capacities, quality and creativity is impressing, as well as their world renowned pima cotton and alpaca. There is still a lot to work on from the business side, but it is great that the US supports them and I was invited to meet this region. Can you take us through your thought process in creating of your collection? What usually is your biggest inspiration? Usually the true inspiration comes to me randomly, as a weird blend of simple but very personal things like the emotions that I experienced through my life, rare art from places I have been to, craftsmanship, and of course independent creative women around me. I love making surprising mixtures of classic and avantgarde with contemporary sporty notes. A very important source for inspiration for me is the eclecticism of New York architecture, and nature it is surrounded by - the ocean, the river and Jersey breathtaking landscape. This is so powerful! Putting all my inspiration through my minimalistic monochromatic lense, I aim to create unconventional and extraordinary yet understated and effortless pieces for everyday. Why nature is so important in your moodboards? What trends are you loving right now? I want my pieces to have close connection with a wearer, and as we all come from nature, it is endless source of inspiration and freedom. Natural shapes are never straight, textures are artistic, earth colors relax, and that is what makes us feel free and mindful. By the way, I use only natural fibers or high tech blends. I love the trend of responsible fashion, as what we wear should be clean and natural, both literally and energetically. Do you have any tips for our readers how to find your own voice in fashion? At first, do not think business too much, follow your heart, become a master in something that you really love, explore. Then (if you want it to sell and be worn, not just admire) apply the other “octave” of your voice - clean it up, make it a product, style it. A unique voice can be found only with that holistic approach. What was your most memorable experience as a designer? When I suddenly started calling myself a designer and artist, at first I was shy. When visitors say that my collection is different and unique, and you don’t want to take my things off once you put it on. It was a very rewarding feeling to see my clothes on beautiful smart women in streets, to hear they feel good in them. My everyday is memorable, I often feel like a heroine of my life movie. Every awesome person I meet, every trip, every investigation, and there is still a lot ahead. I remember collecting tons of wisdoms from multiple sources, when I just started. I do not think it helped a lot, though it made me feel I was not alone. So, start from searching for your voice and your dream position in the fashion coordinates system, then consider where you are now - in terms of your product, finance, time, experience - define your trajectory to achieve your dream. I know, it is hard, otherwise anyone could do it. Ask, surround yourself with those who empower you, but learn from independent criticism. It’s all about how much you want it, just keep on working.